Armistead Maupin returns to his North Carolina roots to reflect on his life's journey from growing up closeted in a conservative family to being a pioneering LGBT author. 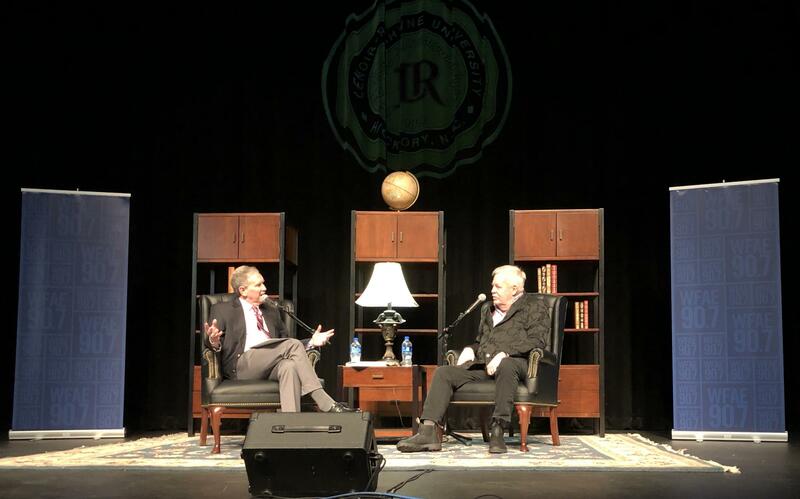 Maupin sits down with Mike Collins for a conversation at Lenoir-Rhyne University in Hickory. The path that Armistead Maupin's life has taken is as remarkable as it is winding. Maupin grew up in Raleigh to a father who romanticized the Confederacy. For a time, he worked for Jesse Helms, and after graduating from UNC he went off to Vietnam. Maupin came home and went to work in newspapers, which landed him in San Francisco in the 1970s. There, he blazed a trail with his Tales of the City serial and books chronicling the LGBT experience in America over the span of four decades. In 2017, Maupin recounted this journey in his memoir, Logical Family. As part of Lenoir-Rhyne University's Visiting Writers Series, Maupin talked with Mike Collins about his groundbreaking writing, including his "Letter to Mama," which continues to inspire Tales readers decades after its publication. Thanks to the audience and Lenoir-Rhyne University for hosting us at the P.E. Monroe Auditorium.